Michael Franti has always stood head and feet above other hip hop artists in the fierce intelligence he has applied to his lyrics. Since his early years with the Disposable Heroes of Hiphophrisy, whose incisive bite was remarkable, he has continued to approach issues with a left-field (and left-wing) perspective that is unusual. Yell Fire! is an incredibly topical album, as Franti has written about the Middle East for many years, and the album was inspired by a 2004 trip to the Gaza strip, Lebanon and Israel, among other places. There is a real question mark over whether Yell Fire! is a great Franti album, however, moving in a musical direction that incorporates reggae-lite and more pop-rock. The power of the lyrics loses a lot of sharpness as it takes on the task of communicating something as obvious as 'war is bad, and wouldn't it be better if we didn't do it'. Elsewhere, there is retreading of old ground on top of so-so music, and it comes off like a new-age Dave Matthews in the second half, until it is rescued by the last song, Is Love Enough? 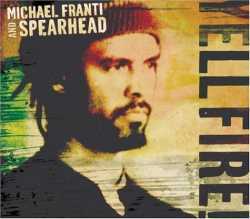 If you are new to Franti, start with any earlier (and the earlier the better) Spearhead album.